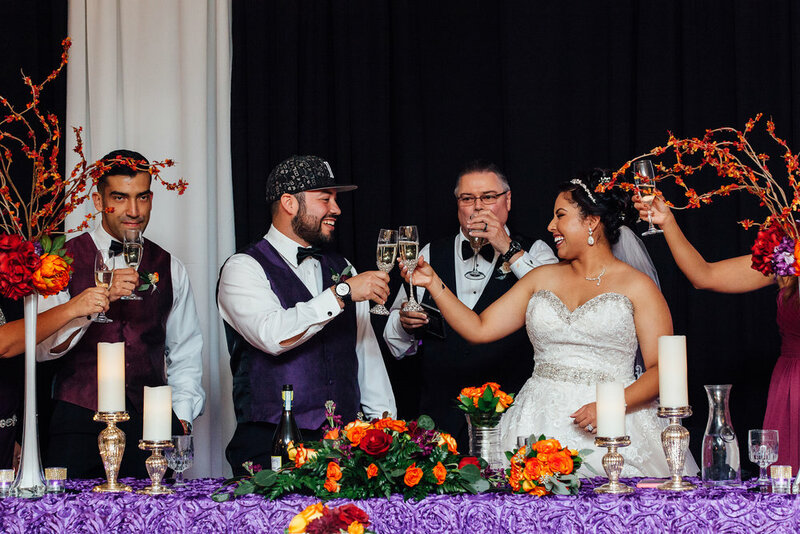 Matthew and Jazmine Gallegos a couple that was married in Albuquerque, NM, back in September 2016 recently were featured in KRQE News 13 because their wedding photographer never delivered their wedding photos. They paid the photographer, the photographer showed up to their wedding, but when it came time to receive their photos…the day never came. It is this part of the interview that really stood out to me. Clearly, having photographs displayed throughout their house was a priority to this couple. Yet somehow they misplaced their trust in a photographer that didn’t deliver the most important part of the wedding photography process. So how did this happen? Based on the social media outcry in response to the story, everyone seems to know how it could have been prevented. There is an old saying that sums it up well. “You get what you pay for”. This couple paid for the services of an inexperienced, untrained, out of area, hobbyist photographer, but expected more than they paid for. There are a few flags that really stand out to me as a wedding photographer that I want to share with you. First, photographers are a dime a dozen. Most professional photographers learned photography shooting film cameras. If you go to a university for fine art, they are still going to make you learn how to develop your own film. It is crucial to understand that relationship between light and camera obscura to train your artistic eye in photography. Unfortunately in an art sense, but fortunately in every other sense, in 2018 everyone is a photographer thanks to our cell phones. And that is awesome and very convenient. But when it comes to art, selfies are not part of the curriculum. Which I believe led to the sad uneducated state we experience today, where the average person cannot tell the difference between a good photograph and a bad one. Which also explains why there are so many “professional photographers” that really just picked up photography as a hobby, have little to no artistic training, and yet offer wedding photography as a service to the general public for a price they came up with by looking at what other photographers in their area are charging and undercutting it. This is a big flag: Price. We all price shop, but there are certain times when I am willing to pay extra to get a better quality product. For example, leather. There was a time in my life when I would buy cheap leather shoes for work (back in my public accounting days). I would spend about $30 for a generic store brand, not like you could see the brand anywhere anyway right? I made sure I would get shoes made from genuine leather because even though I wanted something cheap, I wanted decent quality that would last a while. Despite my attention to that detail, my shoes would fall apart in about a month. I went through this cycle about three times before I got fed up and started looking into spending more for shoes that would last longer. It turns out that as I looked into the features that would help shoes last longer, I learned that genuine leather is not so great. In fact there is only one type of leather worse than genuine leather, and that’s bonded (junk pieces glued together like a plywood of leathers). I was floored. Now I know to get full grain leather, a leather that not only holds together better, but gets more beautiful with age. And guess what? Full grain leather shoes cost about 4 times as much as genuine. I have two pairs of different full grain leather shoes that I have had over 4 years now. One month compared to four years. Even though the price up front was much higher, the cost of the shoes over their lifetime is much cheaper. I share this personal story with you because this is the case in every industry including photography. Many photographers have strayed from the traditional value of displaying photographs on physical walls and have moved onto the walls of Facebook. The average life of a digital file from the archivists I have spoken with, is about 5 years. Whereas when I visit my parents’ house, I see framed photographs on the wall that have been displayed on a wall my entire life. This couple expressed their physical loss of the ability to display their wedding photos in their house. They clearly valued that in hindsight, but they didn’t value it enough to spend the kind of money it takes to hire a professional photographer who makes a living from making such images and physical artwork for their clients. Which brings me to the next flag, a professional photographer is anyone who earns more than 50 percent of his or her annual income from photography. Back when I was a public accountant, and Elise was a photographer, we mistakenly referred to her as a professional photographer. More than half of her income, the money we used to support our family, came from my public accounting job, not photography. Why is that distinction or level of detail important? Because people who make their living from photography are more qualified than someone who just purchased a DSLR camera and decided today they are a professional. And sadly, that is how the industry works. There is no accreditation for the photography industry. There are associations, like the Professional Photographers Association, that awards it’s paying members “degrees” for their commitment to their group. But that is neither here nor there since their members don’t have to be professional photographers to join in the first place. Most brides aren’t looking to see formal education listed on the about page of the photographers they are price shopping. A photographer doesn’t need to hold a Bachelor’s of Fine Art degree in order to create a website that states they are a professional photographer. So the overwhelming responsibility depends solely on the client. The client must determine with their artistically trained eye, or lack thereof, to determine for themselves by critiquing each photographer from their area’s individual portfolio to determine the validity of that person’s claim to be a true professional photographer. Which is crazy, especially considering most have never been through or seen a formal critique to begin with let alone the photographer who they are critiquing. Next flag, reviews. I read comments saying this couple should have looked at reviews to know whether the photographer they hired was legit or not. The photographer they chose had an A- on the Better Business Bureau’s website, which means they had good reviews. Why are reviews not cueing unprofessional photographers? Because my friends, no news is good news. Reviews are usually received when requested. New photographers tend to offer friends and family free photographs to get their foot in the door of the industry and build a portfolio. Then they turn around and ask those same people for reviews. When is the last time you left a bad review for a service or product you got for free? Ratings are not enough when browsing reviews. It would be foolish not to read several of the reviews to determine what people are actually getting from hiring this photographer. What was their experience? Would they recommend or use this photographer again? And even after looking at reviews with this in mind, understand how limited this source pool is. When is the last time you switched service providers in any industry and found out that the new service provider is so much better? Did you go back and leave a bad review on the previous service provider? Of course not. People have their reasons for switching and often are bad at putting those reasons in words without being a troll. So why bother? And that is the downfall of relying on reviews. Look for a wide range of portfolio images form the photographer. Is their portfolio comprised of several different people or is it the same people over and over again? If you see nothing but photos of their kids, then this is a sign they are new to the industry. Look for these kinds of flags, and gamble with your money not your photographer. Lastly, beware of new photographers to the industry and your area. There is a reason why people praise experience so highly in any profession. Hire new photographers at your own risk. Ansel Adams said it best “The single most important component of a camera is the twelve inches behind it.” Ultimately when you hire a professional, you are paying for their capability, consistency, and ability to deliver after the end of the day. All of which comes from experience doing so over and over, time and time again. And going back to professionals making their living from photography not their spouse’s income from their job, beware traveling photographers that move from place to place to wherever their spouse goes for their job. That is a big red flag that this person can disappear with your photos in a heartbeat. The best way to support local businesses is to look for the old salty dogs of the industry. Those who have deep roots in your area and don’t just talk about how much they love the area, but are actually grounded there. They have family here. They went to school here. They contribute to the community here. That is how you build your local community, not by chasing the cheapest, newest options. Those are just gimmicks like genuine leather. Some simple questions this couple could have asked to prevent this from happening to them would look like this. Do they make a living from photography? Have they been providing photography to my area for several years? Do they have a formally trained artistic eye? Have they ever used a film camera and developed their own film? Do they have a wide variety of portfolio images as well as several different clients in the images? If you are reading this thinking “Oh they are just saying look for a photographer like them”, you are right. That is exactly what I am saying, because we would never do this to one of our clients. We have all been there, embarrassingly looking around the room, or sheepishly at the floor as some poor soul gives a train wreck of a speech on the wedding day. If you have just been asked to be a Maid of Honor or Best Man one of the duties of this coveted role is to give a wedding toast during the reception. Here are a few simple tips to give a great, not cringe-worthy, wedding toast. Just like the legendary basketball coach John Wooden said, “Failure to prepare, is preparing to fail.” This toast is a big deal, which is why your friend has trusted you with it in the first place. Honor that by putting in some time and work. Do not wait until the night before to start thinking about what you are going to say. Hopefully this is pretty self-explanatory. This is not the time to tell embarrassing stories about the bride or groom. It’s a toast, NOT a roast. Your purpose is to congratulate, celebrate, and extend well wishes. So keep the wild stories of that one night for another time. Whether your closer to the bride or the groom, make sure you give attention to both. The whole wedding day is about the two of them coming together and becoming one so make sure you address each of them. They’re in it together from here on out. This moment is not about you, or about a performance. Once you let that sink in, you can free yourself from the pressure of being perfect and just speak from the heart. What an incredible moment for the couple and for your friendship, take it in and be in the moment. Look at your friends as you address them. Don’t read from your phone, you can do better than that. We thought it might be helpful to ask one of our newly wed couples, Derrick and Jackie, if they had any advice for newly engaged couples. We recorded it live on our Facebook page, so if you prefer watching a video over reading you can skip to the video below. Here's what they had to say. Jackie: Start planning now. Like immediately. Start planning immediately. Put any deposits or down payments as fast as you can. If you are working on a budget have a long engagement so you can make a bunch of small payments rather than lumps sums. Derrick: I would say go ahead and make a list of priorities of what you want in your wedding. One thing that we did wrong is we started with all the little things that didn't really matter that we thought did then when the priorities came up we had to create more room in the budget to make sure we got those things. And have fun the whole time instead of getting stressed out. Do you have any regrets about getting videography, would you recommend videography? Derrick: Yeah, all day everyday. Jackie: No regrets. Looking back and watching it I know that the first few times we definitely got teary-eyed. My mom got teary-eyed. His mom, I mean everyone that watched it that loves us really really appreciated that. I think it's something that we are going to hold on to forever. We are excited to have kids and have them watch that and see us young. Because I don't think they are going to believe we were young at any point in time! Derrick: It really helps with sharing. One of my really close friends was one of my groomsmen and she is bed rest and can't move and she has know me since I was real little. So that was a good way for me to share that day with her so she actually didn't look at any pictures, didn't let anybody tell her about the wedding and then I sent her an email with the link that I got from Nate and she got to relive the whole wedding. So just that alone was worth it for me. Today the Las Cruces Bulletin released their 2017-2018 Perfect Southwest Weddings magazine, and once again I am honored to have been interviewed for one of the many articles found within. I think writer Adam Palomino did a great job curating three interviews, between myself and two other local vendors, into an easy to read article so if you haven’t seen that yet be sure to check it out. It is on page 20, titled “Treasured Moments: Photography, Videography Packages Preserve Precious Memories”. This time, due to scheduling difficulties, I was interviewed via email rather than in person. Fortunately, that means I have a copy of the questions and my answers behind the scenes. So without further ado, here are the questions I was asked accompanied by my full responses. 1. What’s trending in wedding videography? Wedding videography in Las Cruces is kind of like chalk paint. Chalk paint started trending in other parts of the country about three years before it was even available in Las Cruces. I feel like Las Cruces is finally starting to come around on wedding videography. Brides are really starting to see the value in having a motion picture as opposed to just still photographs. Same day edits, super 8mm film videography, and 4k are trending in other parts of the country right now, but in Las Cruces the value just isn’t there yet. I had one groom ask me “Why don’t you shoot in 4k?” I asked back “Oh, do you have a player that can play 4k video?” To which he bowed his head almost in shame and said “No”. I would love to shoot a wedding with a super 8mm film camera, it would give an organic vintage film look that digital videographers do their best to mimic, but it just never quite looks the same. But convincing a bride to want a 3 minute un-editable highlight video with no audio is a hard sale in Las Cruces. It’s sad really because anything on film will outlive digital data. 2. What options are offered locally? Locally, couples are starting to see their friend’s wedding videos on Facebook and Instagram, and that sparks an interest in having a highlight video from their wedding day as well. Highlight videos, full length edits, and I have even heard that some videographers in town offer the raw video files. The last option is insane to me. I would never hand raw video files over to one of my clients and essentially say “Here you go, good luck!” I don’t expect my clients to have the software or experience I have with color grading, cutting, and audio editing, to make a full video that would be enjoyable to watch as opposed to short video clips they would have to open one at a time to view. In my public accounting days, I had a co-worker show me videos from her daughter’s Quinceañera. She popped a DVD in her PC and showed me the highlight video. Her face lit up as she remembered the event. After it ended, she said “Then they gave me all the video files too”, with a disgusted smirk on her face. She opened up one so I could see, and yeah it was awful. There is a reason why not all of the videos shot that day didn’t make the highlight video. Videographers include their best video clips in the highlight video. Don’t talk yourself into thinking there is more value in having the files that didn’t make the cut. 3. What are the different types of packages one could get; engagement + photo session only? Photo + Videography? And what are the price ranges for packages, generally? Taylor’d Photography is a family business, husband and wife photography and videography team. My wife is the lead photographer, and I am the lead videographer, and I use two of my brother-in-laws to second shoot video for me at weddings, who I trained personally. So we do offer both photography and videography to our clients. And we give a discount for booking us for both. Ultimately, we are trying to help our couples tell the story of how and why they decided to start a family together. Pricing and packages are something we discuss with our clients when we initially meet them. 4. Digital only or prints? What other options, if any? We deliver wedding videos to our clients on DVDs, Blu-Rays, USBs, and also make them available for digital download and viewing online. We also post sneak peek previews on YouTube at our client’s discretion. 5. What’s the process like? How early would you recommend a couple meet with the videographer? What considerations are there when deciding what’s right for a client? When and how often do the couples meet with the videographer to discuss plans/themes/pricing, etc.? The first thing couples should do when looking for a videographer is watch videos from different videographers in town and determine which style they can relate to. The one that feels right to them is the one they should book for their wedding. As far as timing, once you have decided which videographer you like best, book them as soon as you possibly can. We met with a couple that was getting married in 9 months. After meeting us they said they would let us know in a week whether or not they were going to book us. That same week another couple contacted us for the same date. They ended up booking us for their wedding, putting down a retainer to reserve the date. A couple weeks later, the first couple called us and wanted to book us. Sadly, we weren’t available for their wedding date anymore. With that said, if possible, couples should try to book their videographer six to twelve months out. I know for us (Taylor’d Photography), August, September, and October tend to fill up fast. Since we do charge a nonrefundable retainer fee, it is better to lock in a venue or venues if different locations are going to be used for the ceremony and reception, before locking in a videographer/photographer. 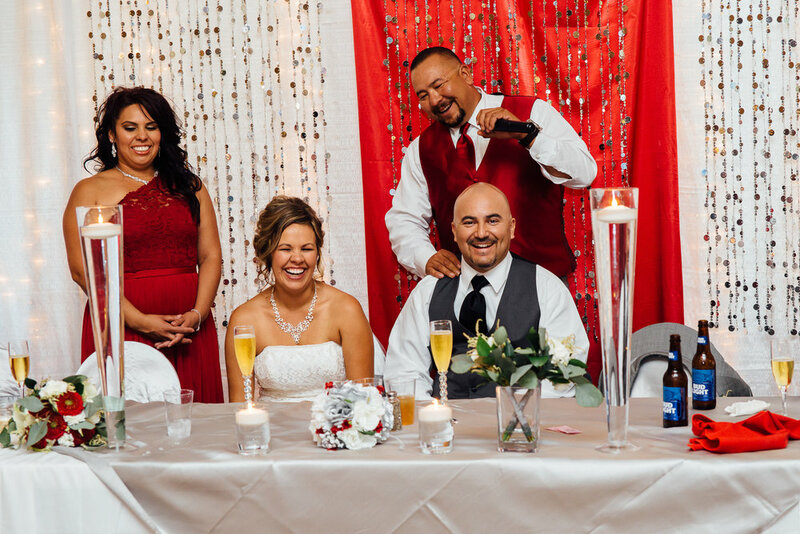 Since we are a family business, we like to meet our clients, and get to know them before we just show up on one of the most memorable days of their lives. So the first we thing we require of our potential clients is to meet us to see what we offer and ultimately to see if we are the right fit. After they have booked us, we hash out more details of their wedding, help them with their timeline for the most photogenic experience possible, and keep in touch up to and after the wedding. We want our clients to feel that we are approachable, and we end up becoming good friends throughout the process. 6. How do couples help the videographer shape the narrative of their wedding video? When a couple gets married they are really starting a family. Our approach centers on what that family is going to want to see. We tell the story of the wedding day for someone who wasn’t there, but wishes they could have been. And the best way we could tell that story is by knowing the couple. When I edit wedding videos I am thinking about what I would want to see if it were my parents’ wedding. I want to see the younger version of my Dad with the same mannerisms, looking at my Mom the way he still does with that beam of light in his eyes. And I want to see the younger version of my Mom shine like she did at their golden anniversary. I want to capture the bride and groom’s personality for their posterity. As a mom, I often reflect on how I am influencing and shaping my daughters’ self-worth and confidence. Or as Melody would say, “Filling their buckets!”. Besides telling my children how awesome they are, what can I do to show them? Here’s where my bias kicks in. Nate and I have made an effort to have family portraits in our home, on the wall. Creating photographs is the fun part. Hanging the photographs on our wall and then watching our kids’ eyes light up when they realize, “That’s me!” is the rewarding part. I want my girls to never have any doubt of their individual importance in our family. If I can help them feel strong and valuable here at home, they can carry that strength and light into the world. So for Nate and I, making sure family portraits and individual portraits are hanging in our home is kind of a big deal. I could not agree more. So what do you have hanging on your walls?